Kendall College of Art and Design of Ferris State University’s (KCAD’s) Wege Center for Sustainable Design has announced the winners of Wege Prize 2018, the fifth iteration of the annual design competition challenging teams of undergraduate and graduate students from around the world to collaborate across institutional, disciplinary, and cultural boundaries and redesign the way economies work. Participating teams—each composed of five students representing different academic institutions and majors of study—were challenged to collaboratively design and propose a product, service, business, non-profit organization, or other solution to a “wicked problem” of their choosing. Specifically, teams pursued solutions that could function within and help create a paradigm shift towards a circular economy, a rapidly-emerging economic model that focuses on system-wide innovation and aims to be restorative and regenerative by design. The five finalist teams in Wege Prize 2018 presented their solutions to a judging panel of leading practitioners and advocates of design thinking and sustainability at the Wege Prize 2018 Final Presentation and Awards Event, held on May 18 at KCAD in Grand Rapids, Michigan, USA. Teams’ solutions were evaluated on factors such as depth of research, technological and financial feasibility, alignment with circular economic principles, and potential for successful real-world implementation. Solution: Circular Tourism Mexico proposed Rutopia, an online platform that facilitates the transition to a fair, sustainable, and circular tourism system for indigenous communities in Mexico. The platform connects indigenous-run community tourism initiatives directly to their target audiences and offers them the tools they need to overcome obstacles that prevent them from competing in the ecotourism marketplace. At the same time, it ensures travelers will be able to enjoy genuine experiences while benefitting both indigenous communities and the environment. Moving forward, the team plans to use their prize money to finish building out their online platform and begin real-world testing in collaboration with the indigenous communities with which they’ve been working throughout the course of Wege Prize 2018. Solution: Sabon Sake proposed the use of biotechnology and web-based technology to transform bagasse, the main waste byproduct of sugarcane farming, into bio-compost fertilizer, increasing accessibility to the larger sugarcane market for rural farmers in Ghana’s Volta Region and helping them achieve greater yields, reduce crop losses and ultimately, overcome poverty. The team has designed a composting system that uses liquid bio-inoculants and vermicomposting to extract maximum value from the bagasse while negating the harmful environmental impacts of burning it, the method by which it is currently disposed. The team plans to spend the next year building on their existing prototype by continuing to work with sugarcane farmers in Ghana to begin implementing their system throughout the Volta Region, and from there, will pursue translating the system to other crops as well. Solution: Booming Babies proposed an online secondhand children’s clothing subscription service that builds a community of dedicated users while scaling adoption with mobile technology and RFID tagging. The team’s solution also plans to upcycle clothing that has reached the end of its life cycle through aggregation and remanufacturing by partnering with fabric dissolving/melting firms to create new fabric durable enough for extended use and soft enough for babies to wear comfortably. Following their success in Wege Prize 2018, the team plans to launch their business, Hand Me Up, which offers subscribers seasonal packages of second children’s clothing specific to the child’s age, physical size, and gender. They will launch the business in cooperation with Merry Go Rounds, a children’s consignment boutique in Massachusetts. The other two finalist teams—CarpeJur and Greener Haven—were each honored with a $1,000 Finalist Award. CarpeJur, composed of students from American University of Armenia, Armenian National Agrarian University, and Yerevan State Medical University of Armenia, proposed a closed-loop aquaculture system wherein freshwater fish are raised for human consumption while the system’s natural byproducts are upcycled to create additional value. Algae raised alongside the fish act as a biofilter, cleaning the water so that it can be recirculated into the system. Oil extracted from the algae is used in the production of biodiesel fuel, while the algae are used to create animal feed and the organic “sludge” left over becomes natural fertilizer. Greener Haven, composed of students from Yale University’s School of Architecture, School of Forestry and Environmental Studies, and School of Management, proposed to resolve the information asymmetries of the residential housing construction market to connect those who need building materials with those who have materials to sell. The team developed a mobile/web platform combining geolocation and image hosting services to enable crowd-sourced aggregation and sharing of data on materials newly harvested from demolished structures. The platform also provides educational tools to guide users on how to harvest these materials from the waste stream and unlock their potential for reuse. The five finalist teams were chosen out of an original field of 17 teams representing 63 unique academic disciplines and 36 different academic institutions from 12 countries around the world. Over the course of seven months, teams developed their ideas from a one-page proposal into a multifaceted design solution informed by their own research, ideation, and experimentation as well as direct feedback from the judges, culminating in the final presentations on May 18. 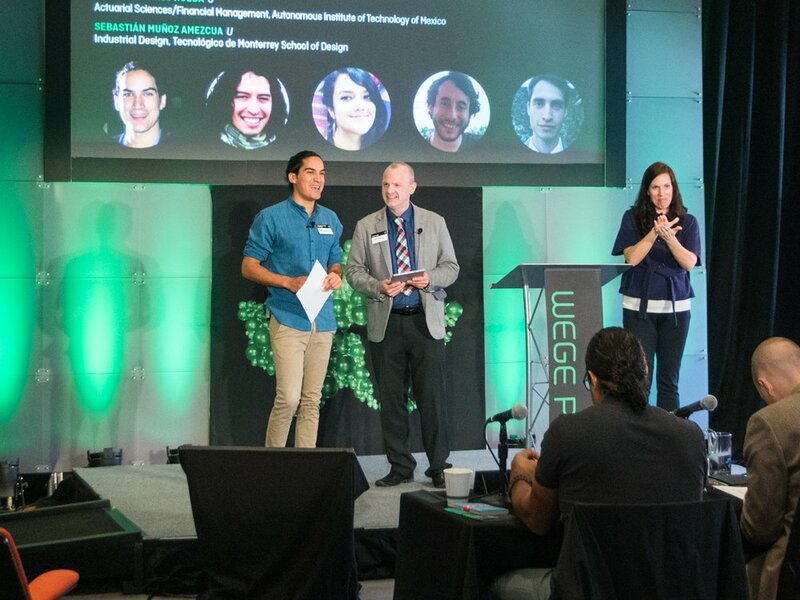 Thanks to the continuing financial support of The Wege Foundation, Wege Prize 2019 will again be open to any undergraduate or graduate student in the world and will be focused on developing a circular economy. Team registration will open in August 2018, but interested faculty, students and professionals are encouraged to begin now by signing up for the Wege Prize mailing list, following Wege Prize on Facebook, and connecting on the Wege Prize Facebook Group. More details about Wege Prize 2019 will be revealed in the coming weeks on wegeprize.org.